Oya opened in the space that used to be Tivoli, an excellent little Italian restaurant, on Exchange Street in Malden. At first I was sad, I really liked Tivoli, but then I realized that I hadn’t been in ages, as Tivoli had unbelievable slow service. Also, don’t confuse Oya with O Ya, the uber-expensive sushi restaurant in the Ladder District. I went with Allison and Carol for a pre-bowling event dinner. The restaurant was virtually empty at 5:30pm, but by 7pm the place was hopping with people enjoying the food and live musician. Carol and I shared 3 appetizers for our meal: Mini Cuban Sliders ($10), Chicharrones y Vieiras (Seared Scallops and Crispy Pork Belly) ($10) and Beef Empanadas ($8). 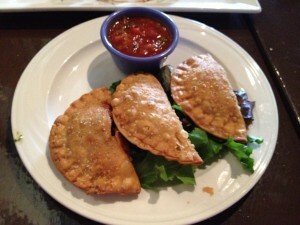 The empanadas were delicious, a blend of beef, spices and olives. The crust was flaky and not too greasy. I really love Cuban sandwiches so I was looking forward to trying Oya’s. The sliders were cute mini sandwiches, but the pork and ham were dry. The worse part is that the pickle was served on the side as a single spear. That’s just wrong. 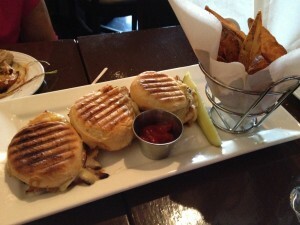 I did enjoy the crispy wedge fries that came with the sliders. 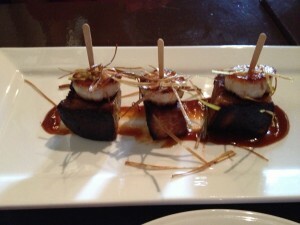 My favorite appetizer was the unctuous pork belly with the perfectly seared scallop. It didn’t taste particularly Cuban to me, but it was delicious. Allison had the sirloin steak ($20). I thought it was a little tough, but flavorful. 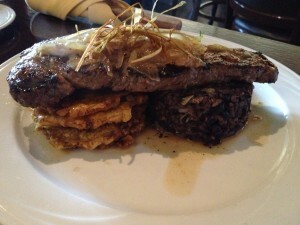 It came with dry tostones, but excellent black beans and rice. 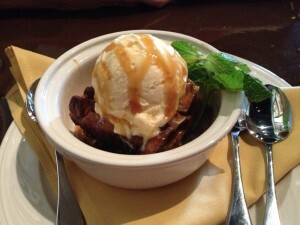 Even though we were full, we couldn’t resist sharing the bread pudding ($6). It was served warm, with a scoop of ice cream and caramel sauce. I usually find bread pudding boring, but the deep caramel notes and the contrast between the crusty exterior and soft, tender interior mixed with the cool ice cream was sublime. Our server was friendly and attentive. The bread basket contained plain rolls, but they were warm, which elevates all bread. I loved the herbed butter that came with the basket. The portions were large and the prices are extremely reasonable. There is easy on street parking. The live music was a nice touch. I really enjoyed my meal and I will certainly be back to try other items.